The inaugural Global Pluralism Award Ceremony took place in November 2017 in Ottawa, Canada. The recipients were invited to attend and present their work at the ceremony and other events. The Centre’s Board of Directors, national and international media, and distinguished guests were in attendance. Learn more about the 2017 Global Pluralism Award ceremony. Each winner will receive a commemorative sculpture that has been designed and handcrafted by renowned German artist, Karl Schlamminger. 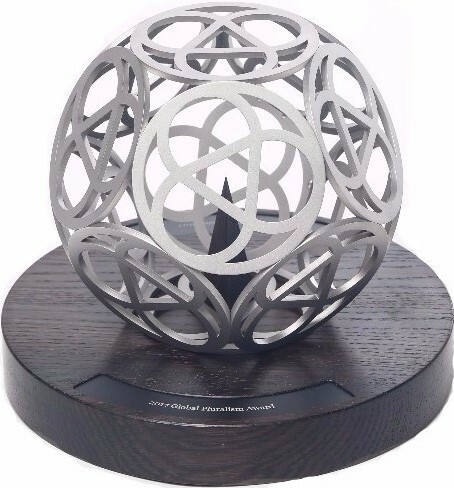 The Global Pluralism Award sculpture integrates the trefoil motif of the Centre’s headquarters at 330 Sussex Drive, Ottawa, Canada in a dodecahedron. By extracting 12 units from that tracery and recombining them into a dodecahedron, Schlamminger obtained the form which conveys the idea of a global initiative. The filigree allows the viewer to look through the object having a total view of the outside and inside. When pivoted, a multiple variety of aspects, integrated harmoniously, become apparent. The resulting threedimensional latticework yields a plurality of intersections, offering ever new vantage points, symbolizing pluralism. The Award sculpture is made of noble materials: sandblasted stainless steel for the sphere, bog oak for the plinth and anodized aluminum for the name plates.